Even though we still have more than a month yet to go with full summer production, I'm rounding up the winners of this year's garden and making lists of things I want to plant again next year. Let's start with tomatoes. I had some real troubles in one particular section of the garden. Several plants underneath and near our peach tree did very badly, and I'm not sure if it's due to all the years of copper spray we put on the peach tree (which does kill soil life even though it's an 'organic' treatment), or the fact that those tomatoes got more shade. However several varieties did not produce even one fruit. These were Kolb, Black Beauty, Carbon, Cour di Bue, Pineapple, Vorlon, Black from Tula, and Sheboygan. Black Beauty did produce fruits but all were immature and never grew to size nor ripened. The Sungold cherry was near this section and also did not do well, only producing a couple of fruiting clusters, not the usual riot of fruit that we get from this variety. Other varieties produced just one or two tomatoes (Kellogg's Breakfast, which we've had great luck with before, Ukrainian Purple, another that has done well for us before). Since I only planted 32 plants in total, not getting any fruit from eight varieties, plus slight fruit from another three was a real problem. I have only canned 12 jars of tomatoes, three cans of salsa, and frozen six jars of garlic/basil/tomato sauce. I did manage to dehydrate another quart. But this is nothing compared to what I put up last year, so quite a disappointment. Paste: Gezahnte, Italian Heirloom, Hungarian Heart, Opalka, and Amish Paste. Slicers: Dester, Cherokee Purple, Black Krim, Crnkovic Yugoslavian, Dr. Wyche's yellow, Kellogg's Breakfast, and Martha Washington. Cherry: Beam's Yellow Pear, Austin's Red Pear, Black Vernissage (extremely prolific and large fruits), Black Cherry (we missed having this one this year), and Sungold. I'm hoping to plant 40 tomato plants next year and will add some new varieties to trial. Next up is peppers, our second most important summer crop. For sweet peppers, we've had a good year. I use sweet peppers for fresh eating, for roasting and freezing for winter, and in things like romesco sauce that go in the freezer. Bell peppers are just now starting to ripen and will be ready to go in September, while the corno di toro style are good in July and August. Next year, I hope to plant twice as many sweet peppers. Hot peppers are also important, both the mild ones and the super spicy ones. We use fresh jalapenos in salsa which is canned for the winter. It's also nice to have some for fresh eating or roasting; Adam likes them on grilled cheese sandwiches, in chowder, in guacamole, and alongside Mexican dishes. Many peppers get dehydrated for spices or spice mixtures: paprika, smoked paprika, red chili flakes, cayenne powder, chili powder, chipotle powder (just smoked jalapenos). Many get made into fermented hot sauce or sriracha. Hot peppers were great for us this year and next year I want to plant double the amount. I will plant some of the same varieties and trial some new ones. The ones I won't plant again: Tolli's Italian, Gilboa Yardenne, CA Wonder, Jupiter, Etuida, Escamillo. Sweet: Lipstick, Carmen, Corno di Toro, Glow, Bull Nose Bell, Chocolate Bell, maybe Italian Sunset. Hot: Calabrese Piccante, True Thai, Jalapeno, Magyer Paprika, Alma Paprika, Leutschauer Paprika, Maule's Red Hot. I've tried lots of different beans, and the winner (over several seasons now) is clear: Pole beans, not bush; the variety is Rattlesnake, an heirloom. Picked when young and tender, they taste wonderful. And they're pretty, too! We eat them fresh and also blanch and freeze them for winter. We've tried lots of different cucumbers, and the one that always performs best for us is Boston Pickling. Next year I might try another long thin cucumber, but none have ever performed like this pickling cucumber. Tom has made countless jars of pickles and relish, and we've eaten them in every fresh form we can think of. A real winner. The bees love it too. The only downside is that they are prickly and we have found that wearing gloves to harvest is less painful. Butternut squash always does well here. I usually plant Waltham, but this year I tried a different variety and did not write it down. (I know, I know.) Whatever it is, it's beautiful and prolific, and we'll have plenty to eat fresh and some to eat over the winter if I can manage to store it properly. This photo is of an unripe squash, but we are eating our first fully ripe one tonight. I have basil growing in six different places in the garden right now, all at different stages - it's that important to our summer cooking. I use it nearly every day. I also dehydrate a substantial amount to use over the winter in pasta. It's an essential ingredient in our chunky frozen tomato sauce. Most of it goes to make pesto, which I then freeze, at least 12 jars of the stuff. This coming week is the one I've set aside to start this process. I use CA organic walnuts instead of pine nuts, plenty of garlic, and raw-milk parmesan. 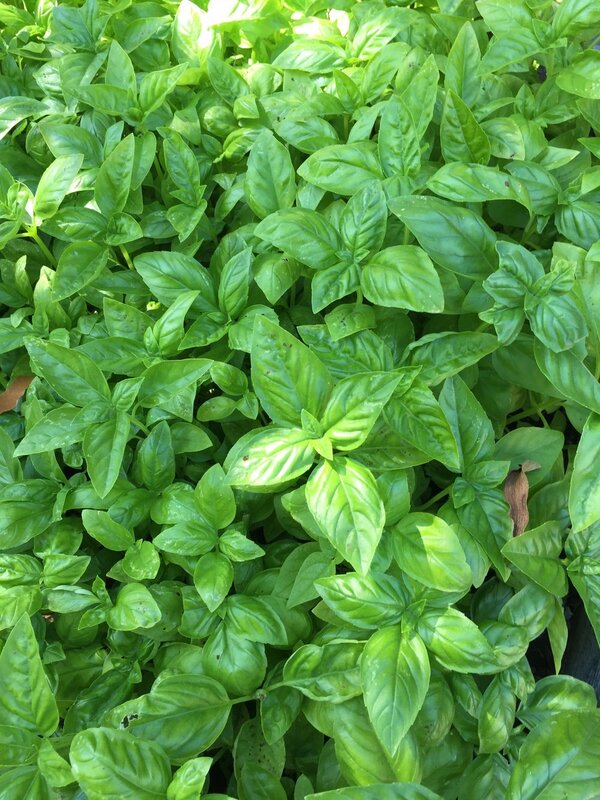 I tend to grow Genovese basil almost exclusively, though I do grow Thai basil for the bees. I've tried all different kinds of pumpkins, and this year I've had the best luck of all. And that's funny, because I did not buy the seeds. Instead I just saved seeds from the pumpkins we bought to carve. I felt they were the perfect size and shape (round and on the smaller side, about a foot in diameter), so I thought I'd give them a try. We have about 8 beautiful pumpkins ready to go, and another 8 or so that are huge and green. The plant has been extraordinarily prolific and I've had to cut it back in several places because it was taking over the pollinator garden and was growing into the next-door neighbor's driveway. I wish I knew what variety it was, it's done such a great job. I planted both sugar snap and shelling peas in late July, in a shadier spot, to see what would happen. Well, we're harvesting sugar snap peas now (Magnolia Blossom variety, they are beautiful and tasty) and the shelling peas (Sabre) are also starting to fruit. So that was a good experiment! Tomorrow I will seed some more so that we continue to have them through the fall. 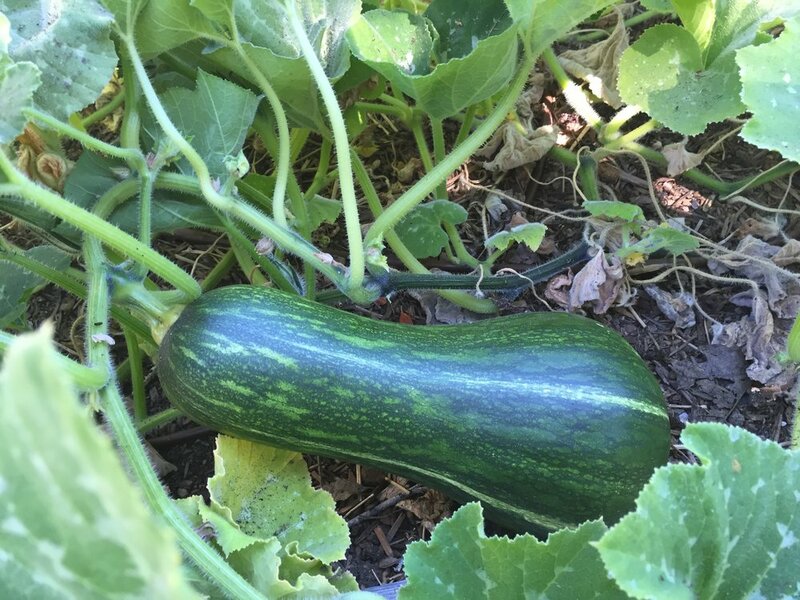 The last of the collards was just given to the chickens; I just re-seeded cilantro; we didn't have good luck with dill this year; our watermelons and cantaloupes are about five inches big right now and will likely not reach maturity by the time I do my October planting. Oh, and our rhubarb is going crazy, we didn't know we'd be able to harvest that all through the summer! And apples - oh my, our tree is loaded with crisp tart-sweet fruit. Delicious. The squirrels like it, too. I'm getting ready to start the winter garden and will sow seeds in the greenhouse next weekend, more on those varieties then. I'd love to know which summer vegetables/fruit did well for you this year, and what you would recommend. Please share your successes!